Special skill & technical personnel for IT ASSET Disposal. Over 500 companies choose REMANn Solutions. Comprehensive disposal services are global trends. 87% of US companies used in 2014(by Blumberg). More than 100,000 annual Security-Disposal. 140,000 Cumulative total quantity of re-development. Build ERP for computerized warehouse management. Build Windows 10 ADK Server. We founded in 2008. Our value is “without abandoning, stay together, along carelessly”. We use two-thirds of the revenue to the public interest. REMANn Co. have the comprehensive IT asset disposal services. REMANn Co. have several strengths as a professional IT assets disposal company. 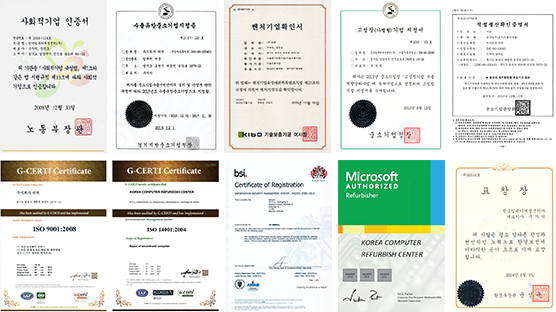 REMANn Co. have received certificates and various awards for qualifications. REMANn Co. have business partners all over the world regarding the IT asset disposal. We are buying used desktops. and selling refurbished desktop. We’re handling business regardless of the amount. It also includes secure deletion process for IT ASSET Data Security. We are buying used laptops. and selling refurbished laptop. We’re handling business regardless of the amount. It also includes secure deletion process for IT ASSET Data Security. We are buying used smartphones. and selling refurbished smartphone. We’re handling business regardless of the amount. It also includes secure deletion process for IT ASSET Data Security. The related online platform is expected to begin soon. We are buying used tablet. and selling refurbished tablet. We’re handling business regardless of the amount. It also includes secure deletion process for IT ASSET Data Security. The related online platform is expected to begin soon. We are buying used monitors. and selling refurbished monitor. We’re handling business regardless of the amount. We are buying used office automation(OA) equipment. Our item is servers, printers, USB, digital camera, wireless routers, speakers, keyboard, mouse, etc.